I'd blogged about resurrecting FIST some time ago, and I'm chuffed to see (hear) movement in that direction. OK so it doesn't seem to be full game. There are a lot of descriptions and encounters, but the combat is , and there is no saving and no record keeping, so collection of items and suchlike depends on trust, and returning to continue the adventure later is impossible. The user interface emulates early hypertext (think 1990s HTML) rather than a pretty or innovative GUI, but the BBC Connected Studio have done a good job on keeping the text minimal. I could critisize that having the options visually present before the relevant audio has played is a fundamental mistake, reducing dramatic tension and atmosphere, but it is only a demo, and one that shows FIST does have some real potential. The Skill Stamina Luck interactive audio web-page accompanies BBC Radio 4's Skill, Stamina, Luck radio program on the history of Interactive Fiction in it's many guises, but features a large bias towards Fighting Fantasy. Most of it isn't new to the die-hard Fighting Fantasy fan (and indeed the 'funny shaped dice' used to illustrate the program on the iPlayer is slightly irksome! two normal dice would have done! ) 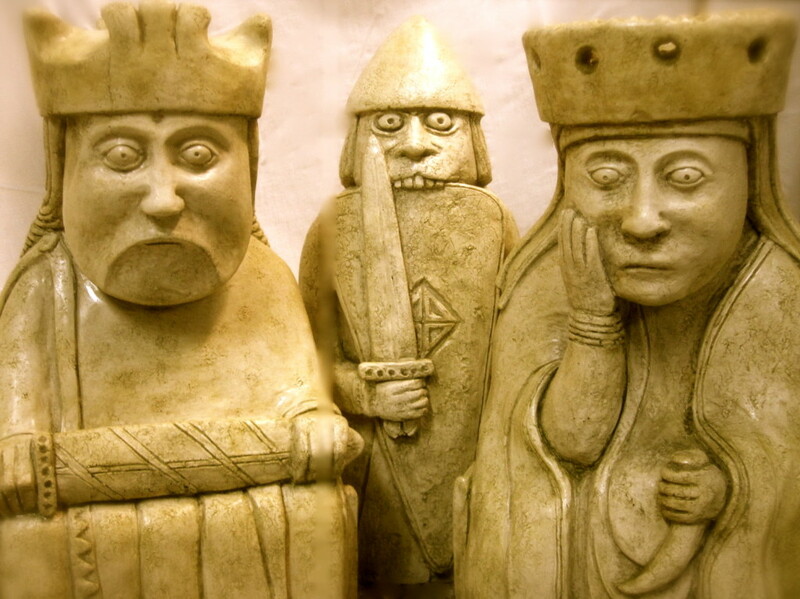 but it's an entertaining and informative listen, with several dips into the BBC archive for material about D&D etc. Welcome to ZTV where tonight we've lined up an amazing pre-election interview. In the interviewers chair we have Zhu Bajiee, thrice standing Anarcho Syndicalist Party candidate for East Cheam, internationally famous leader of the Peoples Popular Front of Oldhammer (on alternate Tuesdays), campaigner for creature-rights and acting spokesperson for the Bugbear Liberation Front. 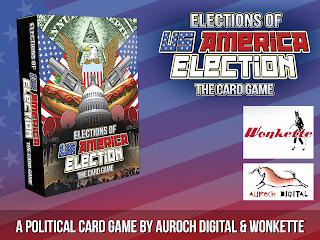 ZB: Ahem *cough* The Elections of US America Election: The Card game eh? So why choose the 2016 American Elections as subject matter? is this so-called game not just another tool perpetuating the continuing hegemony of American cultural imperialism? TR: We did a newsgame during the 2010 US elections but I knew there was much more I wanted to say and I've always loved both RPGs and board games with a 'political' element. Politics is so human and you see the whole range of noble virtues and skullduggery. 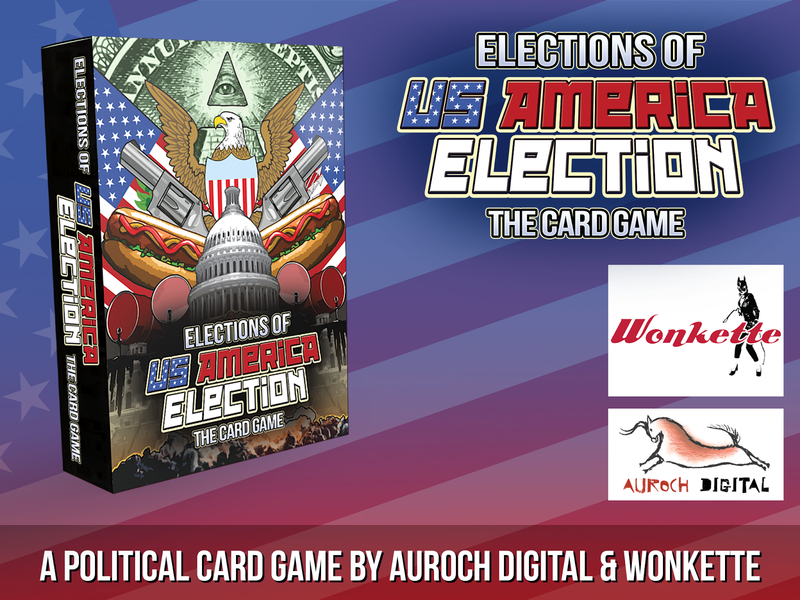 Perfect for a game, in short and the political event that impacts us all, wherever we live, is the US elections. ZB: Well, certainly the US Elections get more media attention than the East Cheam by-elections, but then we are a Nuclear Free Zone. Back to gaming, obviously Monopoly was designed as a teaching tool by the Right Wing Capitalist elites of America to justify their anti-revolutionary and destructive ideology, oppress the working classes with inflated property prices and obscure the fact that all the land being bought and sold had been stolen from the downtroden indigenous peoples. However, there has always been an insightful and decisive revolutionary, satirical streak in British gaming, from the anti-establishment expressions on the Lewis Chessmen radically satirising the class system, to Games Workshops early Warhammer such as McDeath - I have to plug that or the Peoples Popular Front of Oldhammer will lynch me - and, erm, the crossword in Private Eye. TR: Sorry... was that a question? ZB: I, er... erm... maybe? Ah! 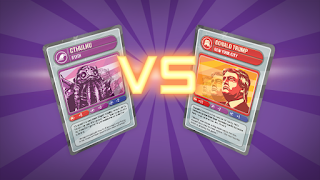 What gaming or satirical material inspired you to do gamethenews , in the general, and US America Election: The Card Game, in the specific, as it were ? ZB: Right on comrade! Highlighting the parallel between medieval-themed games and the neo-feudalism of right-wing late-capitalist worldview really brings to the fore how the 1% are plunging us into the new Dark Ages. ZB: Is the abstraction inherent in gamification of politics ultimately trivialising and obfuscating to the very real socio-economic problems inherent in the corrupt and debased system of late western so-called 'Democracy', which is nothing but a three ring circus run by corrupt capitalist-interests? Do you think playing games about serious issues just trivialise them? TR: I don't think so at all. Games are systems and a great way to represent one system (the US political one) is via another system (a game). As soon as humans get together, politics is not far off, even if we don't see it. Look at how MMORPGs develop factions and factions mean both in-fighting and group-fighting. Humour is also a powerful way to both get someone interested and challenge how people see things. 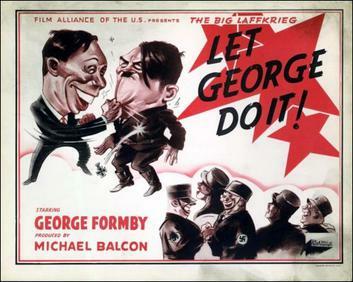 TR: By way of example did you know that research from the time showed that during the darkest days of WW2 one of the biggest boosts to civilian morale was a scene in a film starting the musician and comedian George Formby where he punches out Hitler! ZTV profile: George Formby. The original Kung Fury. ZB: Nice one George! This is the first physical game from Auroch Digital. In face of global warming and impending ecological disaster how do you justify the wanton murder of trees and destruction of the environment for the entertainment of ironically bespectacled latte-sipping, iPad waving decadent western consumer-classes? Why go for a physical card game, rather than a digital one? TR: I cut my teeth as a gamer and game designer on physical. 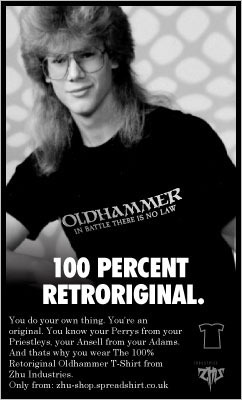 I started with D&D and Car Wars and moved to 40K, Chainsaw Warrior, Dark Future and Call of Cthulhu. I still play physical games and am really happy to see they have been undergoing somewhat of a renascence of late. We interrupt this broadcast for a message on behalf of the Elder Gods Party. 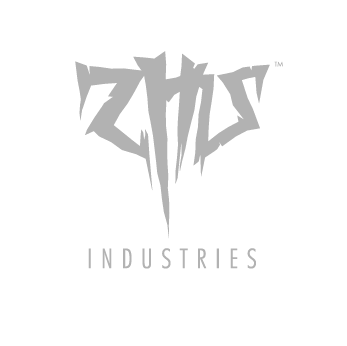 ZB: Yes indeed, physical games are certainly striking a blow against the technocratic capitalist-state surveillance system. Is it difficult, as a designer, to achieve mechanical game-balance, and not to bias the game towards your own inherent and latent political agenda? 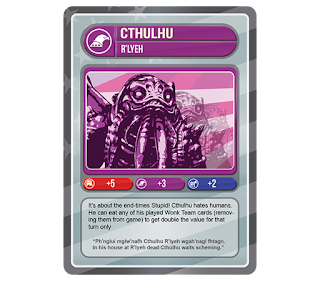 Especially when, obviously, anyone in their right (or left) mind will be voting for Cthulhu in any of the forthcoming elections, ever? TR: Yes, you've got to down-play Cthulhu's stats somewhat - else the game would be "Draw Cthulhu, Win." But its comedy gameplay any way so that gives us the licence to have fun with it all! The game needs to be funny, yes, but above all it needs to be good. Always good. Next up on ZTV: Cthulhu vs. Trump. Satire ...or Prophecy? ZB: I notice you have appropriated freely available Creative Commons artwork in the game. How do you sleep at night whilst profiteering off the the hard work of the downtrodden proletariat artists who graciously donate their work to the commons, which was intended for the benefit of us all, and not just take the mickey out of politics? TR: We have and we've credited it as we should. Over the years I've done lots of Creative Commons projects, edited Wikipedia and other such things. It is part of the rich tapestry of art and culture and I'm glad it is so! 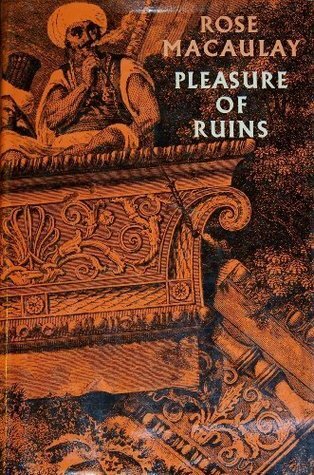 Lovecraft's work being out of copyright, for example, means it enjoys a continual re-invention and that is a good thing, even if not all that is made is particularly good. ZB: Well I'm sure your card game falls in the 'good' category. Hey. Hold on a minute, me and Kelvin were talking about kickstarting a satirical / political card game, whilst discussing Chainsaw Warrior II, you nicked our idea! Oi where's my 10% ?!?! No, no never mind Kelvin's important contribution, just gimmie the money! ZB: Oi Rawlings. Come back here! What about a fiver for the blog interview then? Cover the train fare to Mornington Crescent? No... He's gone then. Oh well. I'll never get that hotel in Mayfair at this rate. Sigh. I suspect that concludes our interview. Cheers comrade!